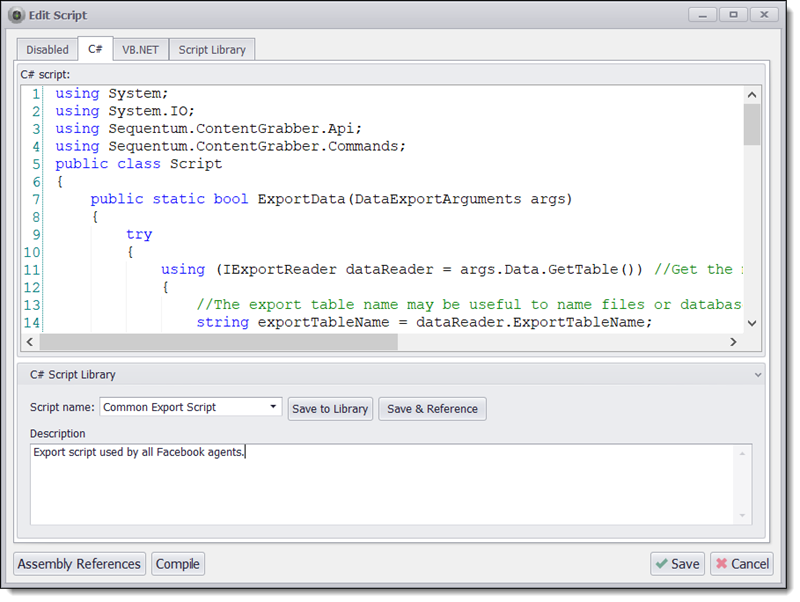 Content Grabber has a Script Template Library that allows you to easily share scripts between agents. This library also contains some standard scripts for common operations, such as regular expressions used to extract emails or phone numbers from a piece of text. You can save a script to the library at anytime when writing a script. Simply enter a script name and a description, and click Save to Library or Save & Reference. See Template References below for more information about template references. If you save a script with the same name as an existing script, the existing script will be overwritten. You can load a script from the library by opening the Script name drop down box, and then selecting the script you want to load. Press the Copy button to copy the script from the template into the script editor. Press the Reference button to copy the template script into the script editor and reference the script template. See Template References below for more information about template references. All templates can be exported and imported, so you can move the templates from one computer to another. 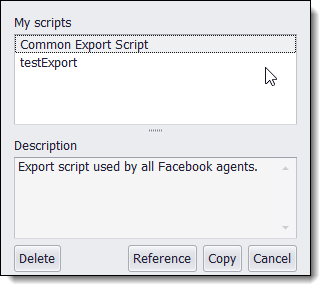 Content Grabber exports or imports all templates, including agent, command and script templates. You cannot export or import just script templates. Export or import templates from the Tools menu. When using a script template, a copy of the script will be inserted into the script editor and can then be modified and saved to an agent. If the script template later changes, it will not effect the script that was saved to the agent. If you have many agents that use the same script templates, it's sometimes convenient if any change to a template is reflected in the agents that use the template. This is possible by using a reference to the script template instead of a copy. When adding a script template reference, a local copy of the template will be stored inside the agent. If an agent is copied to another computer where the referenced template doesn't exist, the local copy of the template will be used instead. When editing a script that has a script template reference, the local template stored in the agent will be modified, not the computer wide template. If the agent is reopened, the local template stored in the agent will be replaced with the computer wide template, and any changes made to the local template will be discarded. When saving a script that has a script template reference, you will be given a choice to save changes to both the local script template and the computer wide script template.